The grey parrot is a medium-sized, predominantly grey, black-billed parrot. Its typical weight is 400 g (0.88 lb), with a length around 33 cm (13 in), and a wingspan of 46–52 cm (18–20 in). It has darker grey over the head and both wings, while the head and body feathers have a slight white edge to them. The tail feathers are red. 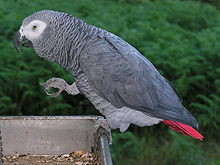 Due to selection by parrot breeders, some grey parrots are partly or completely red. Both sexes appear similar. The colouration of juveniles is similar to that of adults, but the eye is typically dark grey to black, in comparison to the yellow irises around dark eyes of the adult birds. The undertail coverts are also tinged with grey. The adults weigh 418–526 grams (0.922–1.160 lb). The grey parrot is native to equatorial Africa, including Angola, Cameroon, the Congo, Gabon, Ivory Coast, Ghana, Kenya, and Uganda. 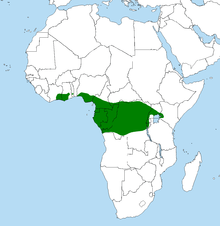 The species is found inside a range from Kenya to the eastern part of the Ivory Coast. Current estimates for the global population are uncertain and range from 0.63 to 13 million birds. Populations are decreasing worldwide. The species seems to favor dense forests, but can also be found at forest edges and in more open vegetation types (gallery and savanna forests). A population study published in 2015 found that the species had been ″virtually eliminated″ from Ghana with numbers declining 90 to 99% since 1992. They were found in only 10 of 42 forested areas, and three roosts that once held 700–1200 birds each now had only 18 in total. Local people mainly blamed the pet trade, and the felling of timber for the decline. Populations are thought to be stable in Cameroon, and in the Congo an estimated 15,000 are taken every year for the pet trade, from the eastern part of the country. The annual quota is 5,000. The grey parrot has escaped or been deliberately released into Florida, USA, but no evidence shows that the population is naturally breeding. Grey parrots are monogamous breeders that nest in tree cavities. Each couple of parrots needs their own tree to nest. The hen lays three to five eggs, which she incubates for 30 days while being fed by her mate. The adults defend their nesting sites. Both parents help take care of the chicks until they can go off on their own. Grey parrot chicks require feeding and care from their parents in the nest. The parents take care of them until 4-5 weeks after they are fledged. Young leave the nest at the age of 12 weeks. Little is known about the courtship behavior of this species in the wild. They weigh 12–14 g (0.42–0.49 oz) at hatching and 372–526 g (13.1–18.6 oz) when they leave their parents. They are mostly frugivorous; most of their diet consists of fruit, nuts, and seeds. The species prefers oil palm fruit and also eat flowers and tree bark, as well as insects and snails. In the wild, the grey parrot is partly a ground feeder. In captivity, it can eat bird pellets, a variety of fruits such as pear, orange, pomegranate, apple, and banana, and vegetables such as carrot, cooked sweet potato, celery, fresh kale, peas, and green beans. They also need a source of calcium. The natural predators for this species include palm-nut vultures and a number of raptors; monkeys target eggs and the young for food. Grey parrots in captivity have been observed to be susceptible to fungal infections, bacterial infections, nutritional insufficiency, malignant tumors, psittacine beak and feather disease, tapeworms, and blood-worms. Humans are by far the largest threat to wild grey populations. Between 1994 and 2003, over 359,000 grey parrots were traded on the international market. Around 21% of the population of the wild birds was being harvested every year. Mortality rates are extremely high after they are captured until they reach market, ranging from 60–66%. Mortality among imported birds is high. This bird is also hunted for its meat and for its parts, which are used in traditional medicines. As a result of the extensive harvest of wild birds, in addition to habitat loss, this species is believed to be undergoing a rapid decline in the wild and has therefore been rated as endangered by the International Union for Conservation of Nature. In October 2016, the Convention on the International Trade of Endangered Fauna and Flora (CITES) extended the highest level of protection to grey parrots by listing the species under appendix 1, which bans global and domestic trade in the species. The species is common in captivity and is regularly kept by humans as a companion parrot, prized for its ability to mimic human speech, which makes it one of the most popular avian pets. An escaped pet in Japan was returned to his owner after repeating the owner's name and address. They are notorious for mimicking noises around their environment and using them tirelessly. While they are highly intelligent birds, they need enrichment and attention in captivity or they can become distressed; feather plucking is a common symptom. They may also be prone to behavioural problems due to their sensitive nature. Social isolation hastens stress and ageing. Grey parrots are also highly intelligent, having been shown to perform at the cognitive level of a 4- to 6-year-old child in some tasks. New experiments have shown that grey parrots can learn number sequences and can associate human voices with those humans' faces. Most notably, Dr. Irene Pepperberg's work with Alex the parrot showed his ability to learn over 100 words, differentiating between objects, colours, materials, and shapes. Grey mutations occur naturally in the wild, like the Blue Ino (albino), Incomplete Ino, and Blue varietals. The Blue Ino is all white. The Incomplete Ino has light pigmentation. The Blue has a white tail. Breeders from South Africa, Australia, New Zealand, and Scandinavia have intensively bred greys since the 1800s. These bred varieties include the Red Pied, F2 Pied, Grizzles, Ino, Incomplete, Parino, Lutino, Cinnamon, and Red Factor. South African bird breeder Von van Antwerpen and New Zealand partner Jaco Bosman selected F2 Pieds and created the first Red Factor Greys. They are rare, can be predominantly red-pigmented, and vary in price depending on the extent of the red plumage displayed. ^ a b c d Bellamy, D; Boyes, S; Dowsett-Lemaire, F; Gilardi, J; Hall, P; Hart, J; Hart, T; Lindsell, J; Michels, A; Phalan, B; et al. (2016). "Psittacus erithacus". IUCN Red List of Threatened Species. Version 2016-3. International Union for Conservation of Nature. Retrieved 2016-12-09. ^ a b c "Grey Parrot (Psittacus erithacus)". World Parrot Trust. Retrieved 9 April 2014. ^ a b c Holman, Rachel. "Psittacus erithacus". Animal Diversity Web. Retrieved 18 March 2014. ^ a b "African gray parrot | bird". Encyclopædia Britannica. Retrieved 2 March 2016. ^ a b c Kooistra, Michelle. "Grey Parrot (Psittacus erithacus) | Parrot Encyclopedia". www.parrots.org. Retrieved 2 March 2016. ^ a b c d e "Psittacus erithacus (grey parrot)". Animal Diversity Web. Retrieved 2 March 2016. ^ a b c Mcgowan, Phillip (2008). "AFRICAN GREY PARROT PSITTACUS ERITHACUS CASE STUDY" (PDF). Cites.org. Retrieved 1 March 2016. ^ "'Catastrophic' decline: nearly 99% of African grey parrots wiped out in Ghana". Mongabay Environmental News. Retrieved 2 March 2016. ^ a b "Future is black for grey parrots". New Scientist. 228 (3049): 9. 28 November 2015. ^ Florida Fish and Wildlife Conservation Commission. "Nonnatives - Gray Parrot". Retrieved 2018-06-28. ^ a b Griffin, Jenny (13 February 2012). "Species Spotlight on the African Grey Parrot". Brighthub. Retrieved 1 March 2016. ^ a b c d "African Grey Parrot Psittacus erithacus". Lafeber Company. 2016. Retrieved 1 March 2016. ^ a b "Grey Parrot (Psittacus erithacus) – Care In Captivity". World Parrot Trust. Retrieved 10 April 2014. ^ "Grey Parrot (Psittacus erithacus) - BirdLife species factsheet". www.birdlife.org. Retrieved 2 March 2016. ^ Wildlife Conservation Society (1 October 2016). "CITES Parties Extend Protections to the African Grey Parrot". National Geographic. National Geographic. Retrieved 2 October 2016. ^ "Stray Japan parrot talks way home". BBC.co.uk. BBC. Retrieved 5 January 2018. ^ Aydinonat, Denise; Penn, Dustin J.; Smith, Steve; Moodley, Yoshan; Hoelzl, Franz; Knauer, Felix; Schwarzenberger, Franz (2014-04-04). "Social Isolation Shortens Telomeres in African Grey Parrots (Psittacus erithacus erithacus)". PLoS ONE. 9 (4): e93839. doi:10.1371/journal.pone.0093839. ISSN 1932-6203. PMC 3976323. PMID 24705445. ^ Stromberg, Joseph. "African Grey Parrots Have the Reasoning Skills of 3-year-olds". Smithsonian. Retrieved 2 March 2016. ^ Pepperberg, Irene M. (2009). The Alex studies: cognitive and communicative abilities of grey parrots. Harvard University Press. ^ "African Grey Parrots". Retrieved 19 May 2016.